Martina Ivey has been the brow queen of the South West for years, so when she moved into her new digs in West Perth late last year I took note. Having previously had feather touch brows done, I thought I’d have to miss out on the delights of Martina Ivey Brow Artistry but was very pleasantly surprised to find out she also offers a few specialised skin treatments, one of those being skin needling; don’t worry, it sounds much scarier than it is. So, What Is Skin Needling? Also known as electric collagen induction therapy, skin needling works by rolling fine needles over the skin to create micro injuries to the dermis and epidermis of your skin. These injuries stimulate your body to create new collagen, and we all know collagen equals bouncy youthful skin. The needles are so fine that the epidermis heals almost instantly so there’s no sign of damage to the skin from the outside, but the dermis will be hard at work ‘repairing’ your skin. Why wouldn’t you? Skin needling is used to treat everything from skin elasticity, wrinkles and pigmentation to scarring, under eye circles and sun damage. It’s your one stop shop to getting the skin of a 12 year old. It doesn’t hurt and there’s little to no downtime. Martina recommends staying in the night after your treatment as you might be a bit red and you shouldn’t wear makeup, but you’ll be good to go the next day. 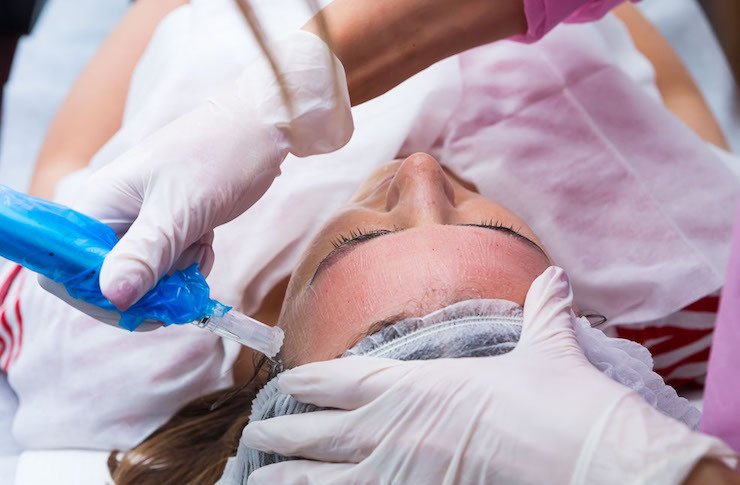 The number one thing to know is that skin needling is far less painful than you might have imagined and the results are pretty incredible. Having said that, the results aren’t immediate and you’ll get the best outcome if you do at least three sessions, so if you’re hoping to get your skin into shape for a big event, you’ll want to get a wriggle on. As already mentioned, you might be a bit red the night after your treatment and your skin might feel a little rough for a few days after (though it will look fine). It’s not until about six or seven days after that you’ll really notice you’re glowing. After each appointment, the results get better and they continue to improve for weeks. How Will The Appointment Go Down? 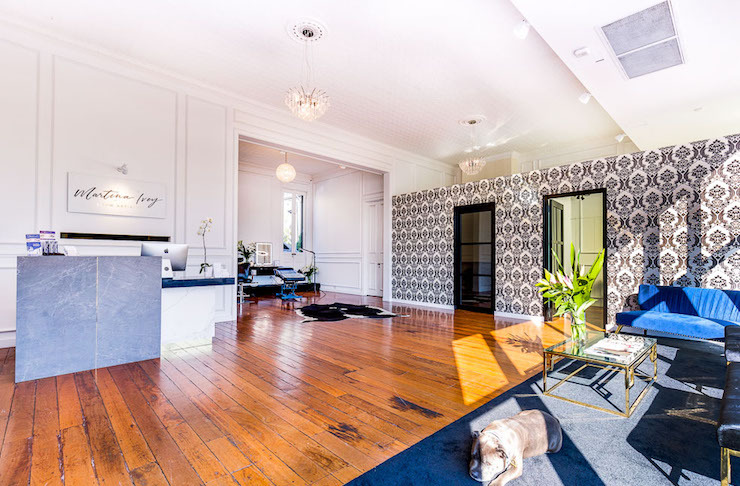 Once you get over the beauty of the salon and have finished saying hello to the salon pooch Hank, you’ll be taken to a treatment room where Martina or one of the other superstar skin specialists will apply a numbing cream to your face. While that works its magic they’ll talk you through the process and the aftercare. The aftercare is so simple you’ll be laughing. The guys at Martina Ivey will supply you with sample sizes of the cream cleanser, moisturiser and sunscreen you need to use for the days following. These are all made specifically for post-treatment skin so you won’t react to them, and they’re all available to buy at the salon if you love them as much as I did. They’ll also use this time to have a chat to you about your main skin concerns so they can work more deeply on those areas. After that initial half hour of numbing time, the actual skin needling will start. It feels not too dissimilar from microdermabrasion and it only takes about 20 minutes, if that. You’ll be out of there before you know it, and my advice is to use your red face as an excuse to have a night in binging that Netflix series you’ve been meaning to watch for three weeks. For the next few days, your skin will be a bit rough and you might wonder why on earth you’ve invested in this. But push through the initial week and you’ll be rewarded. A week after my first appointment, my skin was glowing. I wasn’t seeing any crazy results, but I was pretty pleased with how I looked each morning when I woke up. By a week after my second appointment I was seeing the same results, but this time my skin kept getting better as more time passed. It’s now been three weeks since my second appointment and my skin looks better each day. I’ve only worn make-up twice since then when I’ve been attending big events, and that in itself is a breath of fresh air. Need some help at home? These are the best Vitamin C beauty products on the market right now.